It is a noninvasive body shaping treatment, offers a quick, noninvasive fix for stubborn cellulite, and fat—those areas that refuse to look smooth and toned despite eating right and trips to the gym. It works by combining four different technologies: infrared light (IL), bipolar radio frequency energy (RF), vacuum + massage, and ultrasonic cavitation to give you smoother-looking, less dimpled skin. Just be aware that it’s not a miracle cure; your results will also depend on your health and diet. You will have to do your part in exercising and eating a nutritious diet. Infrared RF Vacuum Roller technology combines infrared light, bi-polar radio frequency energy and vacuum, which cause deep heating of the fat cells, their surrounding connective tissue and the underlying dermal collagen fibers. 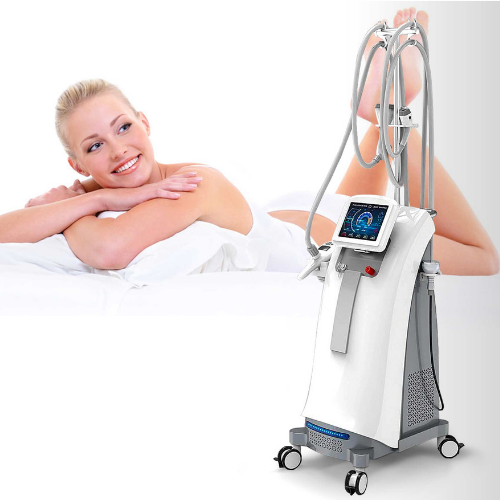 This type of efficient heating and vacuum stimulates the growth of new and better collagen and elastin which results in localized reduction in skin laxity, body volume, and an overall improvement in skin structure and texture. Scope of Treatment: Body Contouring ; Cellulite Removal ; Body Slimming ; Circumference Reduction ; Skin tightening ; Face Lifting ; Wrinkle removal ; Skin Texture & Tone. Four technologies including Vacuum,940nm near-infrared laser,Bipolar RF, 40k Cavitation. Vacuum + Massage mechanism accelerate blood circulation and increase blood flow, so as to drain the excessive water and body waste through the Lymphatic system. Specially designed rolling manipulates RF penetration to be even 5-15mm depth. The technology that vacuum folds the skin makes RF energy penetrate a specific folded skin, greatly improves effect and safety, even the upper eyelid area. 40kHz focused ultrasound cavitation effect, to cause tons of microscopic air bubbles to surround the lipocyte (fat cell) membranes and with its resonant frequency, the bubbles cause a high enough pressure to cause the fat cells to breakup instantly. The laser energy penetrates down to the fat cells and creates tiny holes in their membranes. This causes the fat cells to release their stored fatty acids, glycerol, and water into the body and then shrink, potentially resulting in lost inches. The body then flushes out the expelled fat-cell contents via the lymphatic system or burns them for energy. Reduces skin impedance by heating skin and RF energy penetrates deeply into connective tissue to increase oxygen intercellular diffusion by heating skin. Stimulates lymphatic and blood circulation. Breaks the cellulite and fat deposits, removes toxins. Reduces viscosity of fat cell clusters. Promotes vasodilation and extravasation of oxygen and nutrients. 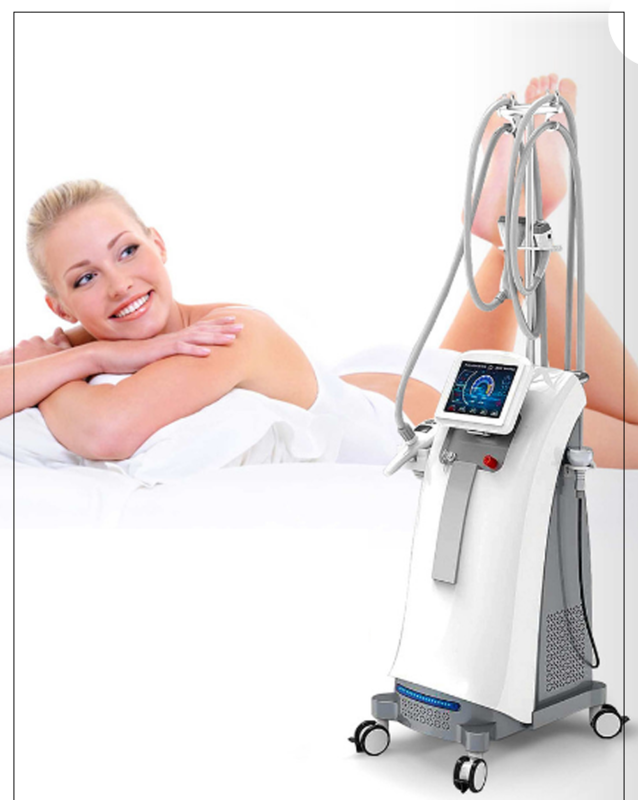 Enables heating at different depths vacuum& RF slimming equipment. 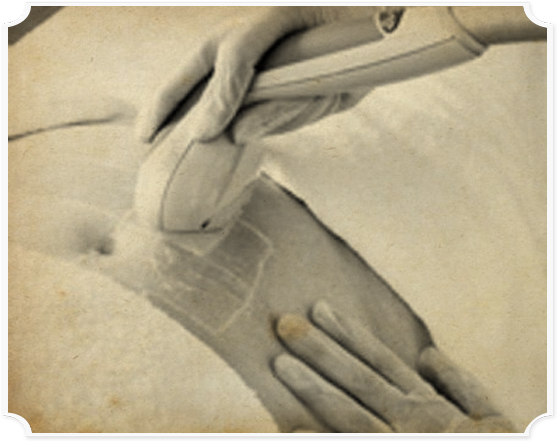 Vacuum therapy also helps restore natural elastin of the skin to soften appearance of facial wrinkles and “orange peel” dimples as well as on thighs and buttocks. 3. Increases metabolism of fat cells. What is 40k Ultrasonic Cavitation ? Ultrasonic Cavitation is a non-invasive alternative to liposuction. It’s one of the safest treatments for cellulite reduction. In places where diet or exercise are powerless, Ultrasonic Cavitation will allow you to reshape your body! Ultrasound waves cause destruction of fat cell membranes, the released content is then absorbed by your body. Ultrasonic Cavitation system uses multi directional acoustic waves to ensure that focused energy is applied to a selected area damaging fat cells only. After releasing fat into system, body starts to break it down and eventually disposes it through lymphatic system over the course of a week. To make it all even more safe, built in transducer provides real time acoustic and optical feedback of the treatment. Ultrasonic Cavitation treatment is painless although may result in some discomfort and momentary redness. What advantages can I obtain from this treatment? Weight loss, localized loss of volume, dissolution of fatty mass, firming of the skin to the contraction of collagen molecules. Is their any pain and what does it feel like during treatments? There is no pain during the treatments. With cavitation the patient feels a slight tickling sensation, at most, a buzzing in the ears. In the ultrasound part, however, the sensation is that of pleasant local warmth. Vacuum therapy provokes a sensation of being massaged. How long does is the treatments? Is there any down time after the treatments? No you can go on with the rest of your daily plans. It depends on each patient, the ares to be treated and the monitoring of each treatment, but between 4 and 12 sessions should be sufficient to complete the treatment. Many clients see up to one to 2 inches (5 cm) of circumference reduction after only five treatments. As stressed several times throughout this treatment the more you work out and eat a healthy diet the more you will lose. Will I need any follow-up maintenance? It may be necessary to undertake bi-monthly or quarterly maintance depending on your diet and activities. What to do before and after treatments? To get the most out of your treatments, we want you to drinking water, maintaining a healthy diet, and exercising regularly in-between sessions. In fact, it’s important that patients drink at least 3 pints (1.5 L) of water before and after ultrasonic cavitation treatments in order to help the body expel the fatty acids. Under no circumstances should this treatment be performed on a pregnant women, People who has fever, infectious diseases, acute diseases. – People with heart disease or configured cardiac pacemaker. – Patients with severe high blood pressure, tumor disease, asthma, deep vein thrombosis, varicose veins, thyroid, cancer, falling sickness. – People with hemorrhagic disease, trauma, vascular rupture, skin inflammation, skin Disease. How much does it cost I am ready to commit? Click on the Book an Appointment Button. It will take you to our scheduling page. We have discounts on booking packages.